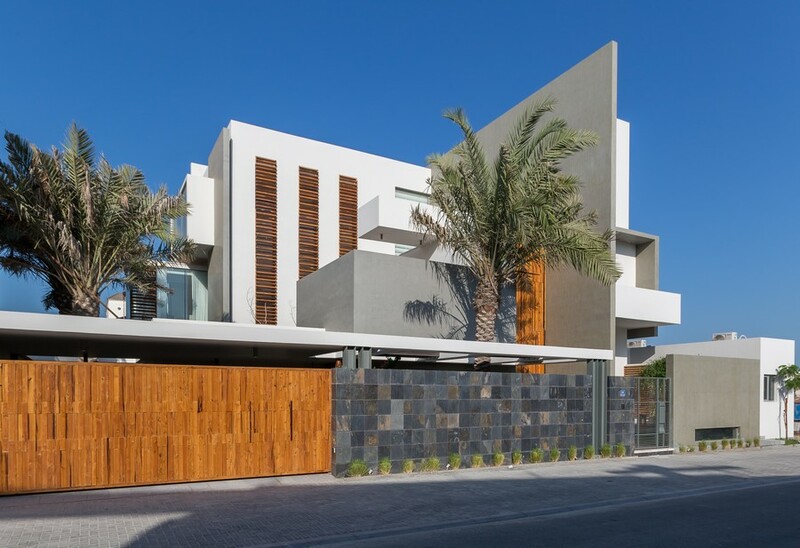 This was a single family home which Moriq Architects designed in an upmarket locality of Bahrain called Amwaj Island. The Clients wanted modern architecture and well defined interior areas and high in design value with as less of decoration as possible. Moriq planned the home on 3 levels, the lower to have the lounges/dining/kitchen and no beds at all. 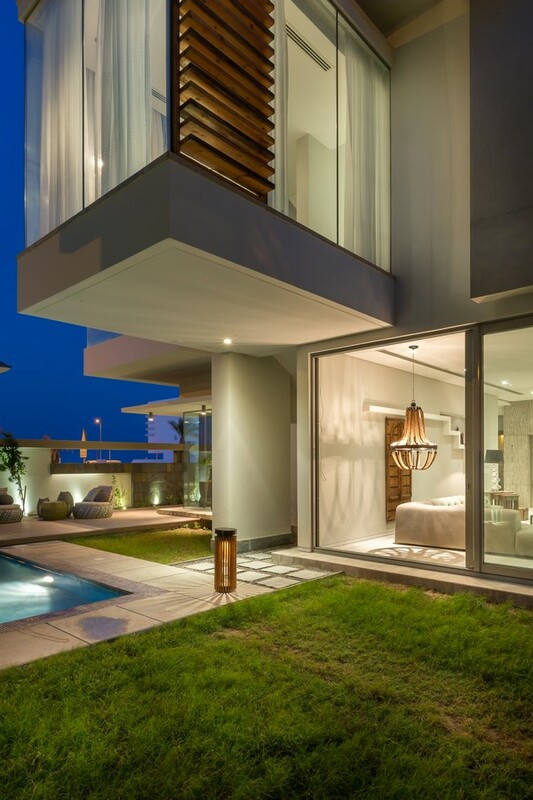 The first floor of Amwaj Villa has 2 bedrooms with spacious walk-in wardrobes and toilets and a common lounge. The top most floors have the master suite with a luxurious toilet and a huge walk-in, and a home theatre/lounge. This was a S/W facing plot almost squarish plot. The construction laws there allow one to touch the building to any one side of the plot. The architects preferred to touch it to the SE side and open up the North Western side. The plot is around 7762sft, built up Gf -3041sft, FF-2346sft, SF-2375 sft. There are 4 bedrooms with walk-in and attached toilets, 4 family and formal lounges, a kitchen + dry kitchen and a wet kitchen. There are 2 servant rooms with toilets and a car park for 2 cars. The client wanted modern looking architecture which should be private from the road. Once inside the compound gate it could/should be interactive with the landscape. They loved water bodies and mini pockets of landscape. Clean crisp interior spaces with minimal decoration and lot of room for the closets. Well integrated, private, smooth transition of spaces. 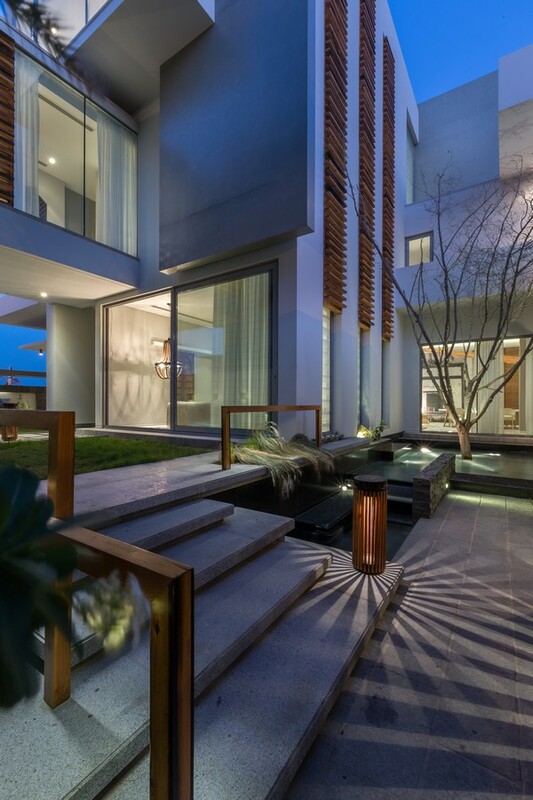 Quality spaces, minimal decoration & superficial treatment exterior wise….the scaling is very residential. It relates to a walker on the street even though it is a 3 storeyed building. 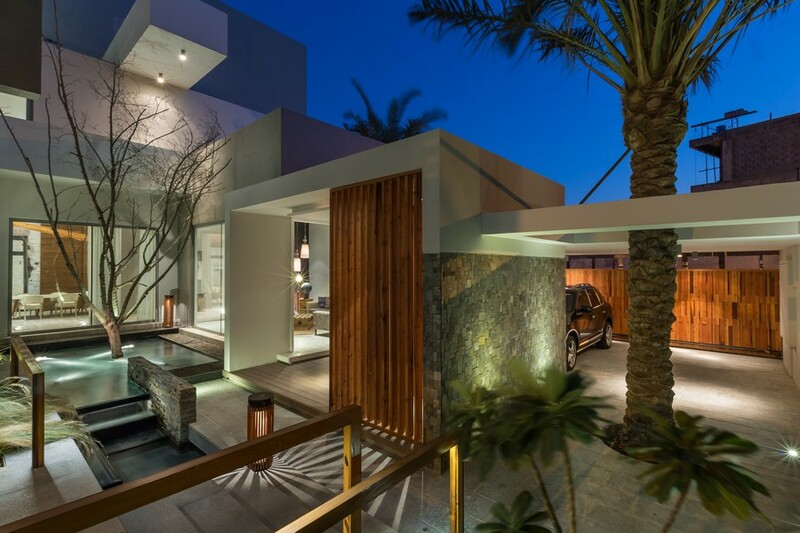 The over-all highs & lows of the exteriors forms creates a visual interest. The façade is white with right hints of wood. It’s a very serene and compact piece of architecture. 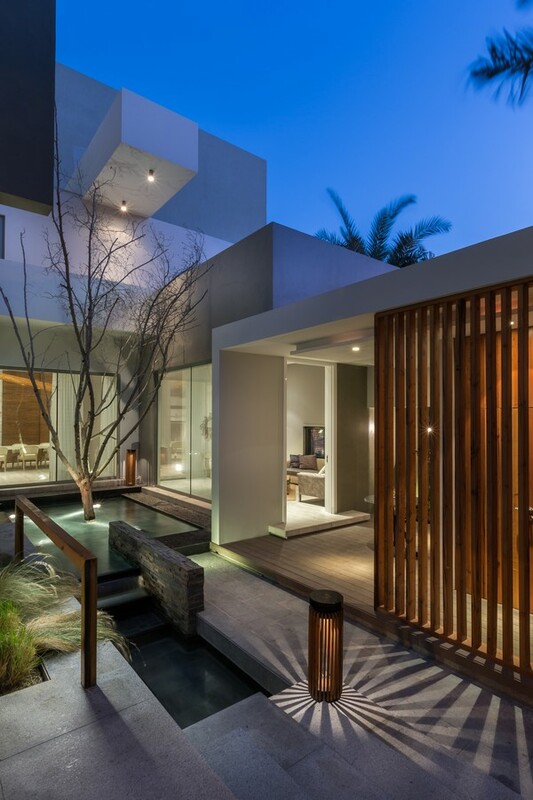 The inside is quite open to the landscape. Very interactive with water bodies as a matter of fact, all the visual interest is derived from various pockets of landscape. 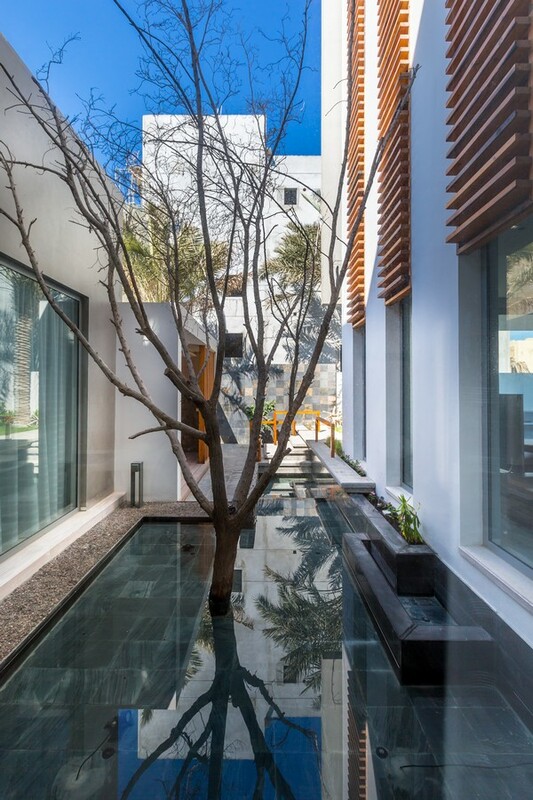 While working on the layout, Moriq Architects made sure that the plan naturally generates quality depths and voids. Multiple view points for a single point of interest were planned. Every room upstairs wanted privacy so gaps were introduced between 2 such areas thereby creating not just privacy but also interest in the architectural form and the spaced out settings of all rooms. The lifestyle there is such that a home has to be very private from the street. It should conceal any activity that happens inside the four walls of the villa…of course things are changing a little bit for the better. Once inside, the interior is quite open to the landscape. Large glasses connect the inside with the out…thereby giving a feel of a private safe heaven within, away from the public. 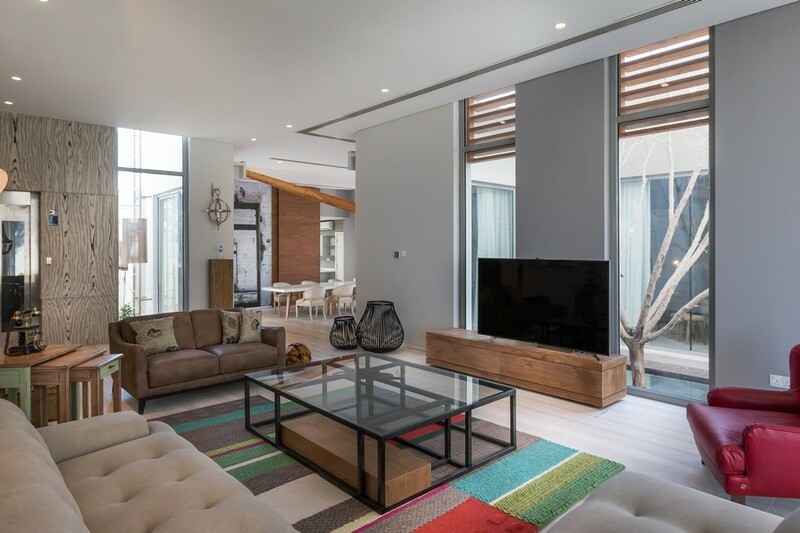 The general lifestyle of the locals there and the clients’ requirement of a private haven were the major factors that influenced the architecture of this house. It was supposed to be white façade with minimal details. 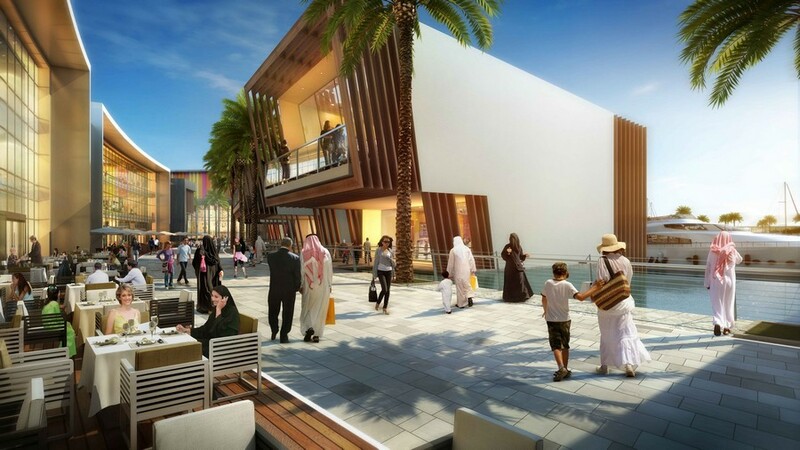 Its more of a climatic requirement than an aesthetic requirement. In the hot months of Bahraini summer, the site of very cool blue water albeit just a sheet relaxes one. It’s made a part of the interior. 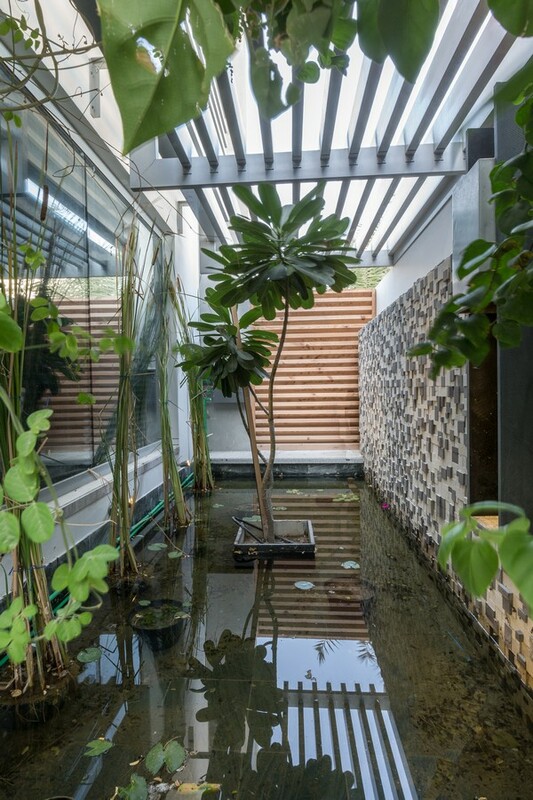 From every corner of every room in the lower floor one can glimpse these water bodies. Cool blue green bisazza has been used here. The residence comprises of the 3 floors. Ground floor has a double ht entrance with a skylight above. There’s a formal lounge on the left hand side opening into a deck. There’s a small tucked in powder room here. A step up on from the entrance the right hand side is the spacious dining room which extends to become the work top. There’s a wet kitchen and a laundry too. 2 more steps up is the living area opening to north western lawns. One step up, a straight flight takes to the first level. Another step up and there’s gym with an adjoining toilet. The First floor has 2 bedrooms with walk-in closets & toilets. There’s a family den and a terrace. Master suite is on the top floor with a semi open toilet and a spacious walk-in closet. Lounge here also doubles up as a home theatre. There is a lift which connects all the three levels. 2 servant rooms with 2 toilets are planned on the lowest level. There are 2 seating’s on the ground floor separated by levels and a landscape pocket. The formal lounge is a step below the entrance and is for visitors, it opens up further into a deck. 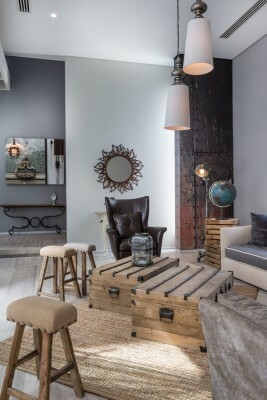 Furniture here is assorted from Roche Bobois and Fendi and the other items are distressed floor lamps and wall art. 2 pendant lights add a touch of warmth. The other lounge which is for family is 3 steps higher and more spacious. Colourful rays invite the —-here. 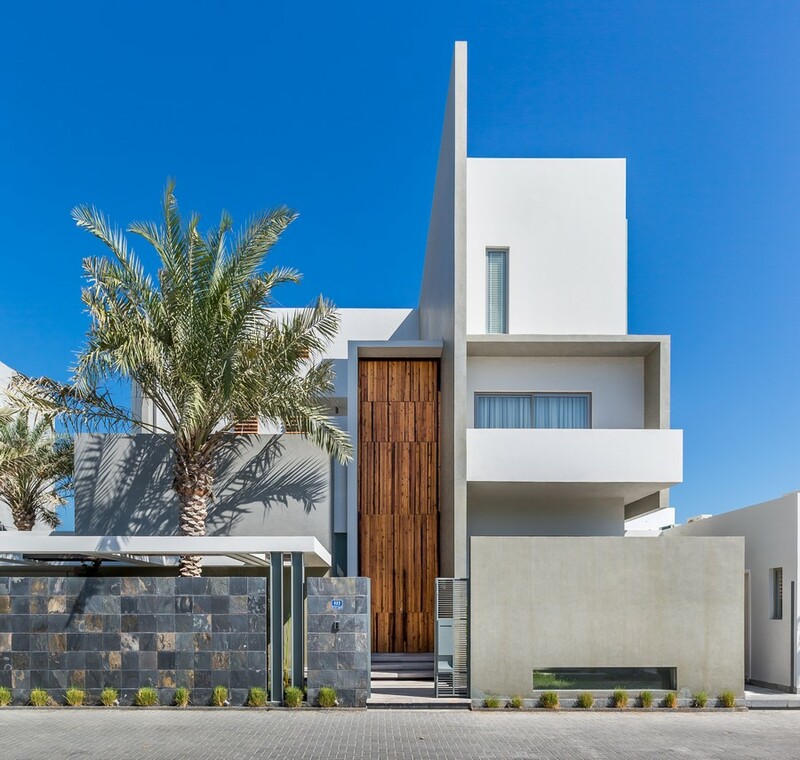 A large sliding door connects it to the exterior lawn. The lounge on the first floor is for the family and friends of the kids. The lounge on the top most level is private seating space for the master’s. 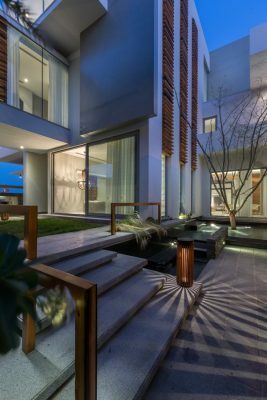 The house was planned for the multiple levels so that there is element of interest and also to bring down the scale of the architecture from the exterior. Perhaps the most interesting part of the house is the dining room. 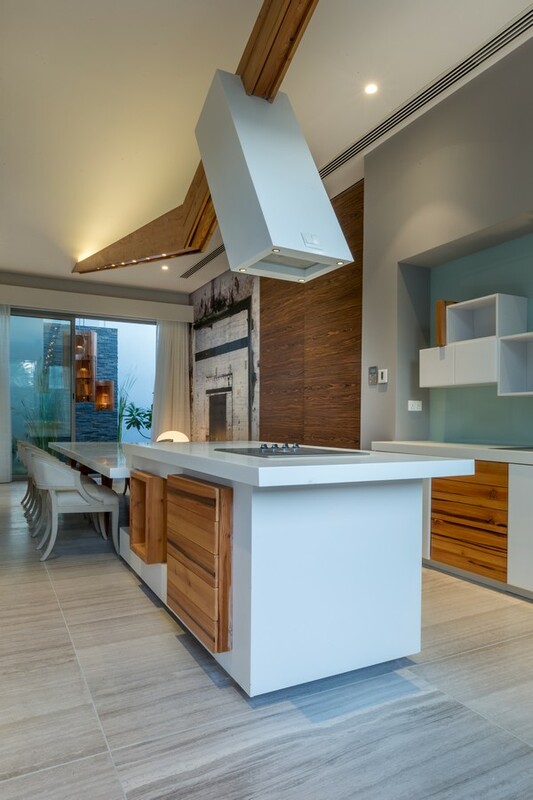 The setting is informal where the custom designed dining table extends to become the cook top/work top. It is conceived in corian. Formal looking chairs complement the whole thing very well. There’s a distressed wall paper of a fire place which gives a certain character to the whole setup. Veneered sliding shutters can open up and connect to the wet kitchen apart from a small glass window(for visual access)which is on the common wall. 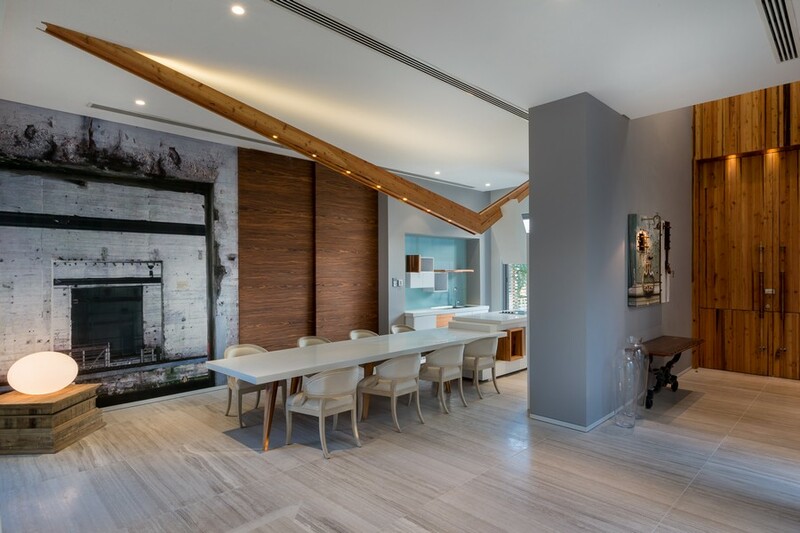 What really sets this area apart is this ‘V’ shaped wooden beam which has one of its kind bespoke chimney hanging out over the hob and filled with recessed light fixtures. Wallpaper has been carefully selected from Roche Bobois. We wanted a ‘connect’ between the random distressed furniture and accessories that we selected and the wall paper. All the selected wall papers are devoid of colour. The rest of the walls are by and large white with hints of grey throw in. Since there was no separate formal dining and the only dining was made to sit along with the open kitchen, we didn’t want a commercial, ‘off the rack chimney’. We created a wooden beam to house this bespoke corian chimney to give it a very warm feel and a look which could be so ‘unique’ to this house. We have realized that the best situation is when the breakfast counter is closest to the work top and also we knew that its futile to give another dining area ( it would eat away one of the landscape pockets) so we fused the formal, informal dining into the worktop. The façade and the interior spaces are kept very architectural and simple because we wanted to emphasize a bit more on the character to the space. But with accessories, we really went overboard and chose such pieces which would at once evoke interest and surprise. It finally balanced very well. The master bedroom was one of the biggest areas of this house. To hold one’s interest, we have cladded the long wall behind the bed in one of the classic panelled black and white wall paper from Roche Bobois. 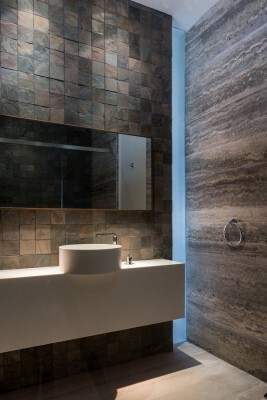 It at once creates an impact and ties up neatly with the travertine cladded wall of the semi-open toilet. Only the bath tub and basins vanity is in open and connected to the bedroom. The rest of the activities are behind cubicles. We figured if a person is spending sometime in the tub, why should he or she be confined in a tight space? Rather let him is connected to a bigger space and interacting. All these pieces are handpicked from across various shops in Bahrain and Dubai. 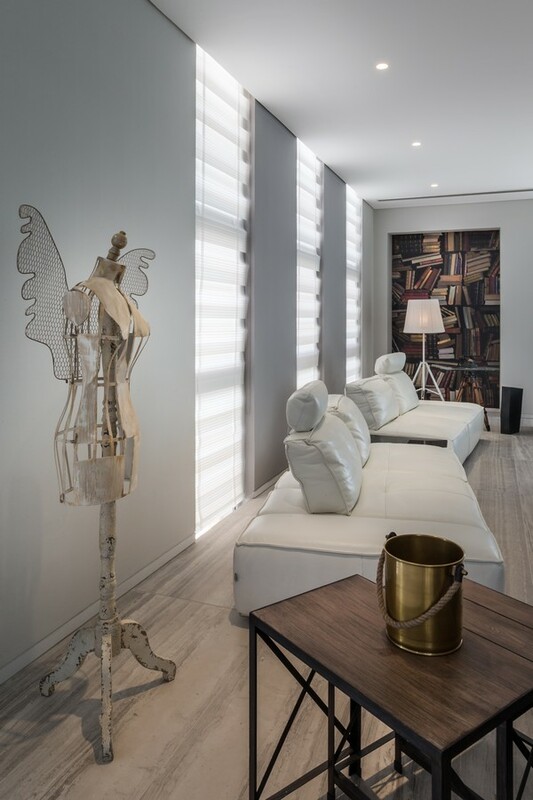 We wanted the personalities of the owner’s to reflect and also complement the space in which they sit. Industrial wall clocks, distressed metal busts, iron & steel lamps, pendants made in ropes, a rustic door panel sit pretty in a modern white setting. A lot of travertines, slates ( in various sizes) and corian was used. All vanity tops were designed. Mirrors were kept small to give a warm feel. 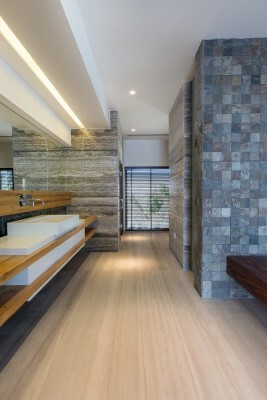 Shades of grey and white are used mostly and one of the toilets is done in wood. Shower cubicles are done interestingly where the spaces is divided further into wet and dry zones. Wooden planks are arranged over the sheet of gravel. Fixtures are mostly white and are selected from Villeroy & Boch and Duravit. Fittings are from Hans Grohe. For flooring, we have used Greek marble throughout. A few walls are done in grey and silver travertines, slates (in various sizes) have been used extensively in toilets and the front feature wall of the compound wall. Exteriors are mostly in shades of white and grey wall paints. Wood used is salvaged wood for parts like the double height main door and the sliding car park shutters. Walnut veneers and some designer veneers are used. Wall papers from. Roche Bobois. For terrace decks, small 4” x 4” square of slates have been used. Gravel has been used in shower areas. Exterior is mostly in laterite grey granite on gravel and exterior deck wood. Parking is done in grey fumbled lime stone. Aqua blue bisazza tiles are used for water bodies. By and large there were 2 challenges( if you can call them challenges that is) one was to keep the scale of the house as small and as residential as possible, especially from the exteriors since there were 3 floors and if ones not careful then the building can jump and sit in another category. )The other was to keep it simple and yet make it engaging.